As we start to enter the cooler months of the year, there are five types of worrisome worms we certainly won’t be warming to; round worms, hookworms, whipworms and heartworms. Dogs can get worms from many different places including food, water and from devouring other animal faeces, ew! 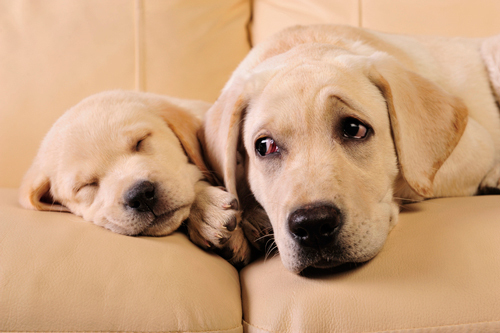 Flea infestations and mosquitoes can also bring about worms in dogs. No matter what the cause, dogs and worms will mingle together at some point of their life. So since they are going to meet without even a proper introduction to each other, as a pet owner it’s handy to understand the different types of worms, where they will reside in your furry pal and how you can get rid of them. There are many different types of worm parasites that fall into the ‘roundworms’ category. The most common roundworm is Toxocara canis. These worms feed on partially digested food in the dog’s intestine. Eating worm eggs off the ground or through an infection that is passed on from mum to pup, are the most common ways dog’s contract roundworm. Signs that your dog may show if it has this type of worms include vomiting, diarrhoea, weight loss, a pot-bellied appearance, dull hair, lethargy and constipation. Hookworms are smaller than roundworms and feed by hooking onto the wall of the dog’s intestine. Hookworms have sharp teeth which can cause the dog’s intestine to bleed, and if left untreated can be very bad for the dog. Other symptoms of the presence of hookworms may include severe anaemia, abdominal pain, diarrhoea, vomiting and weakness. Similar to roundworms, your dog can get hookworms from the ground where other dogs have passed eggs before, or from the milk of their mother is she was infected. Whipworms can also make the dog’s intestine bleed as they bury their long necks into the intestine wall during feeding. Your dog can get whipworms from eating eggs that other dogs have shed. Symptoms include dehydration, anaemia and diarrhoea. Tapeworms also live in the dogs intestine and are usually contracted when dogs eat a flea that has previously eaten a tapeworm egg. Tapeworms do not have mouths, however they feed by absorbing food across their skin. Tapeworms use hooks and suckers on their head to attach themselves to the intestine wall, which can cause dogs to have problems absorbing their food, diarrhoea or scooting (perianal irritation). Heartworms differ from the other worms as they live in the blood vessels and heart of dogs and can be transferred via an infected mosquito bite. Heartworms can cause the dog’s heart to stop functioning and extreme cases can lead to death. Heartworm can be defined in three classes, which increase in severity respectably. Dogs with class one heartworm disease are often ‘asymptomatic’ showing no visible symptoms, or very minimal signs such as an occasional cough. Dogs with class two heartworm disease will tend to show coughing and an unusual intolerance to exercise. Class three heartworm disease infected dogs will exhibit symptoms of anaemia, exercise intolerance, fainting spells, and in severely affected dogs, right-sided chronic heart failure. Treatment of worms depends on the type of worm; since they infest and attack different organs. Heartgard Plus Chews work effectively to prevent heartworm in dogs as well as killing off roundworms and hookworms. Advocate for Dogs and Advocate for Cats works as a prevention for heartworm and treats fleas and infections of gastrointestinal worms. If your dog has heartworms, seek medical advice from your local Vet as soon as possible. Just like a flea prevention program, regular treatment for worms is the key in keeping these pesty parasites away! Do Goldfish Really Have A Three Second Memory?